Unions in Missouri are declaring victory after voters shot down a Republican-backed “right-to-work” law by a hefty 2 to 1. The final vote count was 937,241 against the legislation to 452,075 in favor. Missouri became the 28th state with a right-to-work law on the books in February 2017, when Republican Governor Eric Greitens signed the law at a ceremony in an abandoned factory. In response, thousands of union members hit the streets to gather enough signatures to trigger a referendum vote that could repeal the law. Over the course of six months, activists gathered 310,567 signatures—more than three times the number needed. Right to work was put on hold until voters could decide. Robert W. Shuler II, a forge operator and president of IUE-CWA Local 86821 in Centralia, recruited 35 members to go to poker runs, the state fair, bike runs, and festivals all summer. “It’s already changed the local,” Shuler said. At first the referendum vote was set for this November, but Republican lawmakers moved the date up to August, hoping to hurt the referendum’s chances by suppressing voter turnout—and to avoid a November uptick in union voters that could give Democrats a boost. An employer-backed group also circulated a petition to institute right to work through an amendment to the state constitution. Despite nearly $1 million spent, that effort failed. Last week I spoke with a nonunion single mother. We did not discuss fair share. Instead, we talked about the myriad issues workers face in our state. While talking about medical coverage (and her lack of it) I asked her if she thought our odds were better for expanding Medicaid in this state with a strong union movement or with a weak one? And that is when she got it. If we want to help the tens of thousands without insurance and expand Medicaid, or improve workers lives in countless other ways, it will take a well-thought-out, organized, and sustained campaign. So a strong union presence serves her self-interest—and other nonunion workers like her—because unions are the vanguard for social change. A weak union movement helps no one except the Koch brothers and their ilk. And the bosses. Bosses love weak unions. For Missouri labor movement old-timers, this week’s win is a satisfying reprise. Forty years ago, the National Right-to-Work Committee tried to pass right to work by referendum. Initial polls suggested it would pass 2 to 1, and even get the votes of a majority of union members. National labor leaders feared that a loss in Missouri might trigger a domino effect in other union stronghold states. Jerry Tucker, then a D.C.-based staffer for the United Auto Workers, returned to his home state to manage the 1978 campaign against right to work—which put together the strongest coalition of progressive forces Missouri had ever seen, registered an estimated 100,000 union members to vote, and dealt Republicans a lasting defeat. Voters rejected the referendum 3 to 2. The United Labor Committee, a statewide body with representatives from the AFL-CIO, UAW, Teamsters, and Mine Workers, raised $2.5 million to run the campaign against right to work. Twice the committee requested donations from member unions equivalent to 50 cents per member. Some unions asked locals or internationals to cover the donation. Some, like the UAW, went directly to the membership—which had important benefits. Members were educated about the campaign and gained a personal stake once they reached into their own pockets. For example, Local 93 in Kansas City produced buttons: “I fought against the RTW.” One person on each line was assigned to sell the buttons and inform people of the dangers of RTW. Some paid a dollar; others gave as much as $100. The women’s committee sponsored a dance to augment the collections. Rank-and-file unionists were the mainstay of the campaign. In fact, some couldn’t seem to do enough, and at the outset thought their leaders weren’t doing enough. While the labor committee was still ramping up, members were acting on their own. They set up meetings, visited the merchants with whom they did business, painted signs on their cars, and worked the polls. Many traveled from urban areas back to their childhood homes in rural Missouri to urge folks there to vote “no.” On weekends, caravans of urban and suburban workers traveled to meet farmers and small-town shopkeepers to make their case against RTW. Motorcyclists cruised the highways in bunches, with banners opposing RTW. Truckers used CB radios to maintain a steady stream of anti-RTW conversations on the interstates. Missouri isn’t the first state to repeal a right-to-work law. 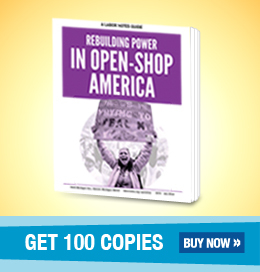 Indiana’s open-shop law, passed in 1957, was so unpopular that it was repealed eight years later in 1965. In a 2011 referendum, voters in Ohio shot down Senate Bill 5, which would have limited the collective bargaining rights of public sector unions and imposed the open shop on the public sector. We Are Ohio’s coalition was very broad: professors, Steelworkers, secretaries, ministers, Teamsters, police, nurses, students, firefighters, auto workers, and janitors. Unions were obviously prominent, but we had organizations behind us as diverse as the Amos project (a Catholic social justice group), Black ministers groups, the Blue-Green Alliance of the Sierra Club, and the Farmers’ Union. Even the Catholic bishops came out against SB 5. To get an idea of the scale of the campaign, during the petition drive to get SB 5 on the ballot for repeal, we had 10,000 volunteers. They spread out across the state, gathering a record 1.3 million signatures (though only 242,000 were needed). When the parade arrived at the secretary of state's office with a semi-truck to deliver all those petition booklets, a structural engineer had to be called in to see if the building's floor could take the weight. These stories have a common lesson. Business groups often rely on courts and state legislatures to force through unpopular anti-union policies. But they can be stymied by democracy.